MAIL POUCH BARNS OF WEST VIRGINIA - $14.95 + S&H - 8.5"x8.5", soft cover, 144 pages, 143 full color photographs. As a professional outdoor photographer, I frequently observed and enjoyed the many Mail Pouch barns around the state. I was struck by how many there were, and occasionally I would photograph an especially attractive or unusual one. But that habit changed in 2003. I decided to locate and photograph all the existing Mail Pouch barns in West Virginia. I visited the headquarters of Mail Pouch Tobacco in Wheeling to obtain records of the locations of the painted Mail Pouch barns. 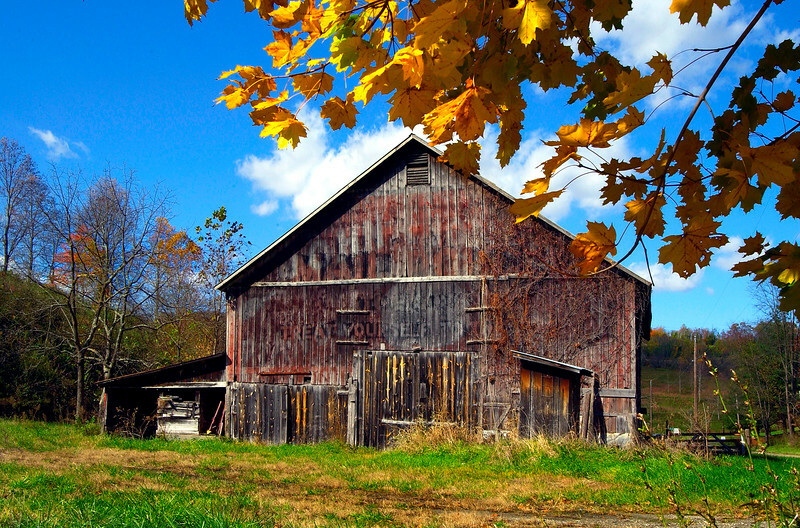 Most of these barns were painted by the man known as “the last Mail Pouch barn painter,” Harley Warrick. Records were limited, but the personnel at Mail Pouch Tobacco were extremely helpful, so with limited records in hand...off I went in search of my Mail Pouch treasures. Most of the images in this book were photographed over a 2 ½ year period from 2003 to 2005, when I spent most weekends and logged many miles traveling with my notes and trusty Gazetteer. During my search I realized that not only barns but also many buildings bore these wonderfully graphic and distinctive Mail Pouch advertisements. I decided to include in my quest any building or sign with a historical Mail Pouch advertisement painted on it. Anything painted by Harley was automatically included. After he retired from Mail Pouch, he continued to privately paint Mail Pouch barns and signs until his death in November 2000. Sit back, relax and travel these WV back road with me, taking a visual journey into the past and present. For the more adventurous type, use the provided directions to visit these locations yourself. Perhaps you can find a sign or two that I missed. Best light for photo's morning to early afternoon.